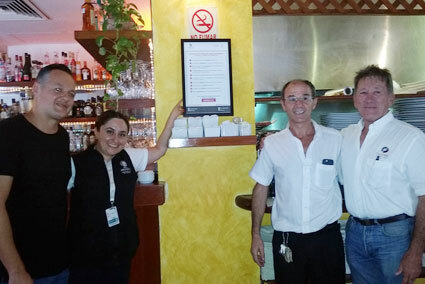 PLAYA DEL CARMEN – To ensure consumers receive fair treatment at Playa del Carmen restaurants, the Federal Consumer Protection Agency (Profeco) has imposed the Decalogue of Consumer Rights. The Decalogue of Consumer Rights was created by Subdelegación Playa del Carmen and the National Chamber of the Restaurant Industry and Seasoned Foods in Solidarity to ensure people eating in Playa del Carmen restaurants know their rights and receive fair treatment. Placed inside specific eating establishments in Playa del Carmen, the list of 10 consumer rights outlines specifics such as all restaurants must clearly display their prices and that tipping is voluntary and cannot be included in the total of the food bill. It also says menu information must be complete with specific portions, that a food bill must be presented to customers at the end of their meal and that method of payment(s) must also be clear to the consumer. In a symbolic move, the president of the chamber of the restaurant industry, Rodrigo Hernández along with Profeco representative Marisol Huitrón, made personal rounds to Fifth Avenue restaurants to place the framed list of the 10 consumer rights inside establishments. Only restaurants registered with the chamber will receive the consumer rights plaque. Any Playa del Carmen restaurant, with or without being a member of the chamber, who violates the rights of a consumer will be investigated and fined. Profeco’s Marisol Huitrón says that any consumer who has a complaint against a restaurant is welcome to visit the Profeco office in Plaza Papagayos where they will create a report and work to find a solution.